Safeguard Shredding believes that your business deserves the highest level of service, the highest level of security, plus fair and understandable billing methods. We offer flexible pricing arrangements based on flat fees "by the container" or weighed results "by the pound." Flat fees allow you to budget and receive the best possible effective pricing — if your volume is consistent and reliable, you'll be able to lock in savings. Pricing by the pound is the best value for clients performing purge work and those who experience seasonal volume fluctuation. The volume of material and the frequency of service will act to lower your effective cost per pound. Safeguard Shredding will provide value to your organization by providing the most secure process in the industry at competitive prices on a timely schedule. Our simple billing programs make the VALUE transparent to the client. With on-going customer support and billing analysis, you'll always be assured that you are receiving the best value for your requirements. 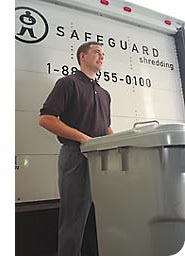 We offer free audit and cost analysis of your current shredding program. You owe it to your company to compare vendor options and update your service delivery with the most modern security methods & procedures. Copyright © 2004 Safeguard Shredding, Inc.